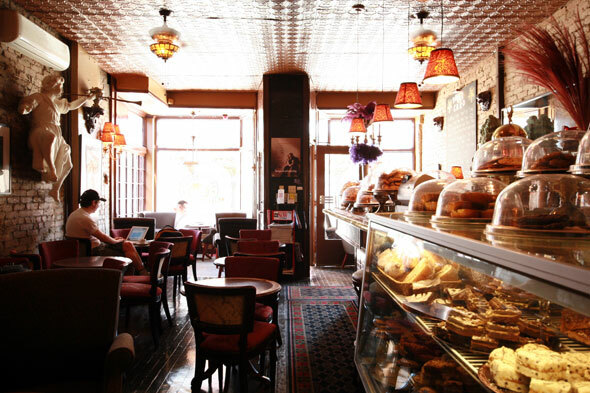 Tango Palace is the perfect place to stop in for an afternoon treat. It's got a really neat Art Nouveau style, stained glass lamps, and large comfy chairs at every table. From the outside it seems dark, but inside this translates into coziness. It seats about twenty, and when I walk in it's positively bustling, the lively atmosphere warm and inviting. As I approach the counter, I'm faced with quite the dilemma: there is a lot to choose from, and most of it looks good. What to choose? 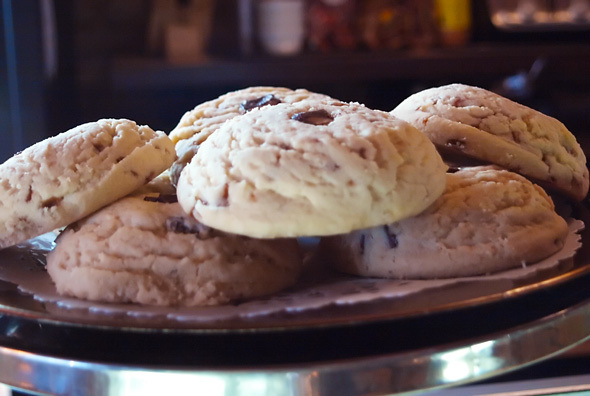 For the sweet tooth, there's everything from biscotti to dessert squares to danishes and much in between. And they even have some vegan and gluten-free treats. On the savoury side of things, they serve organic eats (like lasagna, chili, and paninis) from Miss Cora's Kitchen . 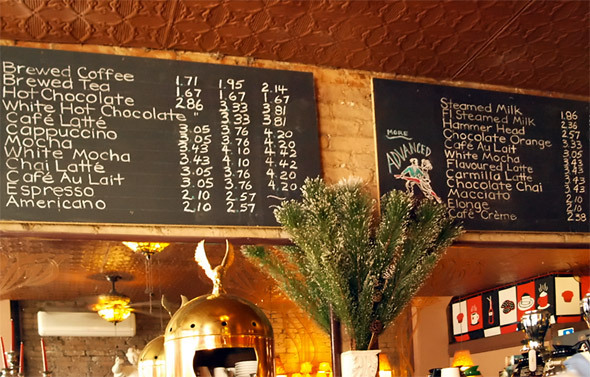 There are six brews of coffee (including organic, flavoured and decaf blends) at any given time. I find that all too often wide variety means low quality, but it seems that since Tango Palace picks and chooses from several bakeries across Toronto, they manage to avoid that trap. As I'm feeling a little overwhelmed by all the choices, one of the employees offers to walk me through the options -- he's really friendly and patient, ready to take all the time I need. I'm told that the chocolate chip cookie is one of their best sellers, so, being a sucker for a classic, I order one along with a lactose-free latte ($6.27 altogether). 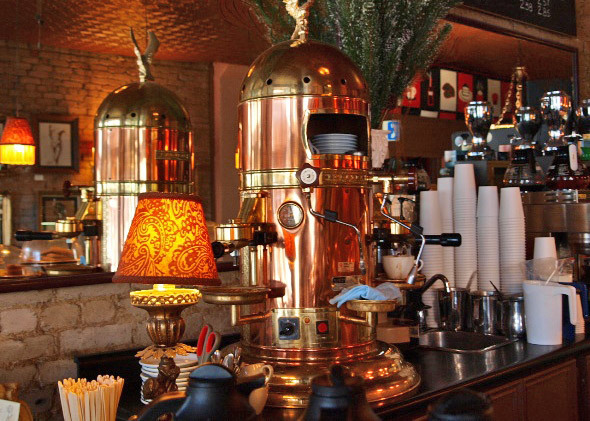 I sit down in one of their armchairs, lean back and watch the patrons come in and out, many of whom are on a first name basis with the barista. I've got to say: while it may all be a bit unfocused, there's a definite charm to Tango Palace. It's like visiting "that" aunt who always offering to feed you. The cookie has been warmed up for me and is now both ooey and gooey , melting in my mouth. I'm struck with nostalgia as I savour it, reminded of the cookies of my childhood, all loaded with chocolate but with just enough salt to balance out the sweet. I take a sip of my latte: it's light, and the espresso has a beautiful flavor. I take another bite of my cookie, sit back, and enjoy. 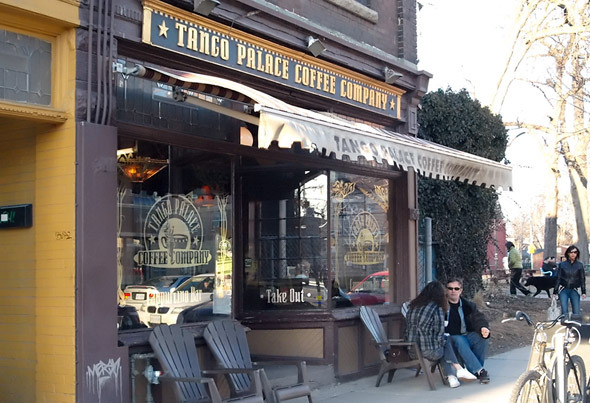 Tango Palace has been a Leslieville fixture for seventeen years, having started out when there were few other cafes around. And it appears to being doing just fine despite the dramatic increase in competition. I have a feeling this has a lot to do with the neighborly vibe of this eclectic cafe -- they make you feel like part of the family. Of course, it doesn't hurt that it's got.. well.. everything. Tango Palace is open from 7am to 11pm every day. They offer free WiFi and open the back patio in the summer. Writing and Photography by Amanda Faig.